Nope, I didn’t choose this one. 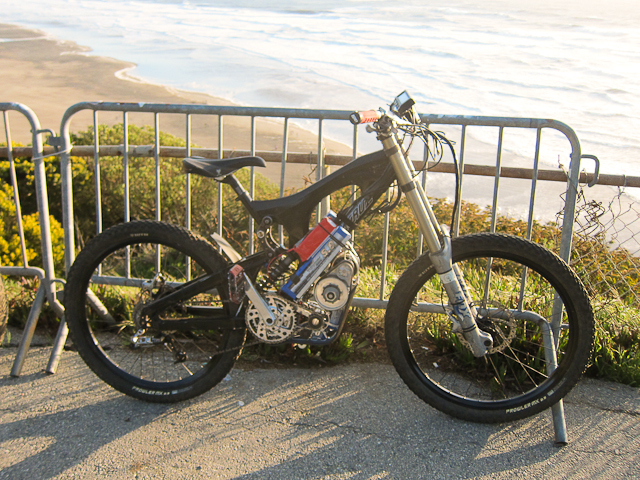 It’s a home-brewed, bike-based electric motorcycle with pedals that’s been clocked at 66 MPH. What – do you want to live forever? Choosing an e-bike is normally easy. You know how you want to use it, then pick something that will do the job for you, hop on, and go. But when you need to chop, blend, baste, puree, knead, bake, and broil, you’re forced to prioritize for the base features that can’t be changed, and then alter what you can change to come as close as possible to what you need. I’ve already outlined a rather tedious and overly-long list of tasks, must-haves and wants in my previous article. I won’t dupe that here, thank your lucky stars. I’ll only mention this or that as relates to the decisions I made along the way, because no one offers just what I need, so I did have to get something with the basics and then hope that I could modify it to suit. I have to caution you that even this process gets pretty tedious in itself, because the bike I picked is not receptive to a lot of standard add-on equipment. Its frame design is highly styled, and at its price point, lacks such things as lugs for mounting fenders or water bottles. My lengthy search eventually boiled down to picking the mid-drive Luna by Evelo. It pretty well meets the list, since it’s a full-fendered cruiser with tires a bit fatter than middleweight, and an ability to take on baskets, bags, and what-have-you without any problem. With its step-through frame, loading up and getting on is still easy. Plus, it offers the option of the sealed NuVinci 360 multi-speed stepless gearhub, a large positive in my book. A higher-capacity battery is also offered, to increase range. The Evelo Luna, my first choice. My concerns about the durability of Evelo’s mid-drive powertrain were aided somewhat by their having pedaled two models across the entire country on a promotional durability test ride. They made it, and both bikes used the NuVinci hub I wanted, too. The only Big Question was how likely the Luna would be able to take on the abrupt hills I often encounter, with its diminutive 250-watt motor. That’s pretty much the standard size in Europe. As a hub motor, 250 watts wouldn’t do the job. As a mid-drive motor taking advantage of gears, maybe. In the end, I had to “stop and ask for directions” by contacting Evelo about suitability to my needs. Asked about climbing ability, Evelo claimed that the Luna could take on nearly anything because of its ability to use the gearbox. But I had doubts, because that perception means one thing to a guy living in Illinois or Boston, and quite another to someone biking in Colorado. So, I spelled out for them the kind of hills and surfaces I would be encountering, the tasks I needed to be able to do with it, and my limited energy. They then recommended a shift to their Aurora model, because that one allows for their optional 500-watt motor pushed along by a 48-volt system instead of the standard 250-watt 36. The Luna can’t accept the bigger 48-volt battery, unfortunately, and Evelo doesn’t do custom work. They reship cartons, albeit cartons containing bikes with their own logos and component choices. The Evelo Aurora, a less practical model with better power options. But what they do achieve is a highly unusual blend of prompt and thoughtful replies, with no canned answers. They are sometimes carefully-worded answers, to make it sound as though they are a Boston-based manufacturer with production runs. True, their supplier has production runs and what they sell are theirs alone, but only in detail. They do have control over what they can order, receive and ship, but the basic bikes are available in other countries by other outfits with their own branding. I could be wrong of course, but that’s my perception. Evelo is a recent startup, with smart management, marketing, and a healthy sense of promotion. They’re working hard to differentiate themselves in a tough market, and their prime standout is an unrelentingly enthusiastic and prompt customer service. Over a long period of time, they dealt with my overly long questions and issues, their replies studded with advice and plenty of links to sources and accessories that would help me transform their Aurora into a quasi-Luna on steroids. They never showed even a hint that they were getting tired of the tedious detail which, given all that I wrote, is extremely impressive. I half-expected them to give up, swallow some aspirin and cordially invite me to have mercy and buy elsewhere. They just kept on going like clockwork. You see, Evelo’s perceived customer base is commuters, leisure riders, and geezers like myself who want to bike but can no longer huff it up long grades. Their bikes are outfitted for a paved urban world, with an ability to take on the occasional bike path to boot. They call the Aurora a “cross-over commuter”, which sounds smart and modern. My needs list was a bit sobering for them. I’d have their bike outside 24/7, and although their bikes are comfortingly weather-resistant, perching one on the front of the Ford and driving in a rainstorm at 60 MPH is not on anyone’s design menu. Neither is pedaling extended distances that include hauling a loaded trailer up rough, rocky hills in a do-or-die bonsai grocery run. Naturally, the corrosive salt of Bonneville was a concern for them, since salt is a quick death to anything electrical. They’ve offered me advice on helping me know what to try to protect. Evelo’s customer service people are nothing if not enthusiastic about their products, and they were surprisingly persistent in finding ways for me to adapt a more powerful Aurora to my needs. This is not too easy, because the Aurora’s basic rider design is standard mountain bike, with the rider pitched forward onto the flat handlebars, just like my Raleigh. But unlike my Raleigh, it is adaptable to change there. But, it will not accept standard add-ons like fenders, panniers, baskets or water bottle carriers. It’s oversized battery is topped by an undersized vestigial rack that complicates hanging anything off it or mounting anything flat on top of it. For tough climbing and range capability, it’s the best choice. But, for rider position and grocery carrying, it’s the worst. I decided to prioritize to the drivetrain and suspension, and just deal with what was changeable to get a workable end result. The additional cost for me to do this would be notable but not of much real concern compared to the cost of the bike itself. By the way, the Aurora’s other cousin is called the Aries, which has a rear suspension added in, and it costs no more than the Aurora! I’m all for a petute-pampering ride, but I hesitated on it for four reasons. First, it is not really a step-through like the Aurora, making climbing aboard more difficult. Second, it costs no more than the hard-tail Aurora, making me wonder about what else was given up in order to make it cost no more. Good, solid pivot points cost money, while cheap ones allow sideways flex that continually gets worse with wear. Adding a trailer hitched to the rear axle would add more stresses. Third, it has a higher seat in relation to the handlebars, throwing even more weight on the rider’s wrists and making ergonomic correction more difficult. Fourth, with all of my needs in mind, Evelo never mentioned the Aries as a potential solution for me. I took that silence as a recommendation, and dropped my interest in it. The Evelo Aries, an Aurora reconfigured with a rear suspension. What exactly would I have to alter on an Aurora to turn it into a stronger Luna? Swap in my existing Spiderflex hornless saddle to protect my nether regions from further damage. Chuck the Aurora’s flat handlebars and add cruiser-style bars on top of a stem extender to get my hands up and rearward, to get me as upright as possible. This is risky, since there are a lot of wires and cables that lead to the handlebars. Moving the bars up and the controls rearward can demand more cable and wire slack than is available. The Aurora’s photos concerned me, but Evelo assured me that certain parts that they recommended had already succeeded. I’d have to go on trust here. Not easy for me, given the cost of the bike. I’d also have to swap in the Raleigh’s self-sealing, extra thick tire tubes and probably its 20-year-old tires as well. That’s because they are in amazingly good shape, and have a very effective tread pattern perfectly suited to the mixed Southwest terrain. Going by photos, the Aurora’s tires did not look very off-roadish, and I’d have to get the tires off in order to get at the tubes, anyway. Wait for the bike and see. I’d have to dig up some way to carry the large and heavy spare battery, which meant guessing what kind of rack(s) or basket(s) might be able to fit a bike that didn’t want to take them. A real rack, a rear one, would be needed for light shopping anyway. I’m not enthusiastic about strapping a heavy battery in front, since its weight affects one’s ability to steer quickly and accurately in traffic. I’d also need to locate some kind of full-coverage fenders that would fit fairly close to the tires despite the utter lack of mounting lugs. Whatever could be made to fit in the rear would have to be pretty bizarre, and the fender-hostile front suspension complicated the situation even more. Oh boy. Thanks to Evelo’s links and my own further research and reckoning, I found a combination of oddball accessories that would at least give me a fighting chance for a decent fit. Being on a tight timeline, with Bonneville looming and much work to do, I pulled the trigger and ordered an Aurora. Then I followed that up with a few accessories, but some would have to wait until I could see the bike in person, take some measurements, and do more Internet and bike shop searching for something in the needed direction. Sometimes there’s just no substitute for grabbing a display item and putting it on the bike. Ordering the optioned Aurora was effortless. Paying for it hurt, even though it is more than competitively priced. The front-suspension Aurora starts at $2079. Swapping in the stronger 500-watt, 48-volt motor and its 48-volt battery cost a steep $675. The Nuvinci hub added $400 more. Rather than prod the bike’s range upward with a 45% bigger, $500 battery, I played it safe and doubled its range and usage availability by ordering a second standard 48V spare for $600. Evelo threw in a handle bar stem extender and bike cover just to be helpful, gratis. Not including the spare battery, that comes to $3,175, which comes somewhat close to popping me into some more upscale bikes – which go back to derailleur gears. No go. I should note that Evelo constantly runs sales of one sort or another. When I ordered, it was $100 off on the bike, and another $100 off the spare battery. Your mileage may vary. I ordered a white-frame Aurora, and the same day, the young CEO emailed me, abjectly apologizing that only black 500-watt NuVinci Auroras were available now, with more white ones due in a month. Considering how white is pretty but shows filth easier, and considering that a month from now I’d have just two weeks left to shake down, rebuild and refit the thing, I opted to live in the now and “settle” for black. This is not your typical canned, automated email receipt announcing that your selection is now in back-order limbo. What I wound up ordering – a black Aurora with a NuVinci gearhub and 500-watt motor. For their part, Evelo really, really wants you to buy their bike. Fortunately, they also want you to select the best fit for you and really, really enjoy your e-bike. To do those things, they help you in any way they possibly can. I have to tell you, they more than earned the purchase on this one. Considering the overhead labor of several people writing long replies to my numerous longer questions, looking up links to products, heading into the cave with a tape measure, and calling to walk me through stuff too involved to write about, they may not get so rich on this one. Their follow-up work is just as obsessive, and any problems are tackled head-on and aggressively. Not too many outfits do what they do, because it’s too expensive and the owner would rather maximize and pocket the profit. Not here. For all of my talking up Evelo’s various bikes and how the company operates, note that I don’t particularly care if you decide to go nutzoid and blow money on one, or not. They aren’t “the best” e-bikes you can buy. They’re simply a different approach from most of what’s out there, are pretty feature-laden for cost, and offer a comparatively good value for the amount you spend. Most folks might be better served by a decent e-bike with a hub motor. I’m getting this mid-drive type because I’m going to beat the hell out of it, making it ascend difficult slopes without a lot of help from me. E-bikes aren’t really made for that, apart from the gonzo ultra-high-amp sport e-bikes that inevitably result from man’s incessant search for wretched excess in any given arena. And that’s the thing about e-bikes. I have no idea why anyone would feel driven to own one if they didn’t actually need the motor assist to do what they want to do. Arriving at work with dry clothing would be nice. Pedaling for exercise or transport when you don’t have much suds left is another. Whatever helps to get you back on a bike and off the couch. I can’t see craving one if you’re a serious cyclist who’s still in good shape, though. What’s the point? You’d be stepping way, way down in feel from the quality hardware and materials of a really good touring or mountain bike that feels almost “alive” for the same money. I can’t see playing consumer with an e-bike either, owning one just to have one for bragging rights, and then adding it to the rented storage unit a year later because of the space it takes up in the garage. Then on to the next toy. But that’s just me. You may see the e-bike market differently, and with less of a stern moralism. Next up in this series: getting the bike shipment, throwing it together, and riding it as-is. What’s this type of e-bike like to ride? So, in case you wondered if anyone’s reading your e bike saga 🙂 yes, I am. And I appreciated the “excruciating detail” of your last post. I can’t speak for anyone else, but I’ve been finding it fascinating. Thanks! I like that term, “utilitarian cyclist”. With the first post being 5,000 words and this one at 2,500, I’m amazed that anyone is willing to saw their way through any of these tomes. The third won’t be any shorter, but it may be a little more interesting at points, being an almost-first exposure to an e-bike by a fading mortal rather than a devout, hard-core cyclist. Thanks for the complements! Good question, Dave. 90% of the componentry subject to wear and maintenance is shared with ordinary bicycles, so any competent bike shop can handle most of the bike. The electricals are another matter. Evelo’s bikes throw error codes in the display if part of the system fizzles, and a phone call to their Customer Service can help with recommendations and dedicated parts. They can also help locate a suitable bike shop if needed. I assume that heavy duty parts swaps like the motor and sprocket drive require finding either a shop experienced with e-bikes, or a bright bike shop. Many riders tackle them out of interest, but I’m unlikely to be dropping needle rollers in the deep dust just for the thrill of it. The NuVinci hub is largely non-serviceable, though it comes with installation and control cable setup instructions. Same for the front shocks. The disc brakes have their own manual. But all these are normal bike items. One plus I didn’t mention in the article is that mid-drives allow tire or tube repairs much more easily than hub motors, which resist easy removal. That was another decider for me. Thought I’d let you know I’m still reading without even being in the market for an e-bike. I’m enjoying learning new stuff anyway. Now that’s a complement Linda, and I’m in the same boat with liking to find out new things. I suspect the only time I’ll give up my love of researching things new to me is after I’ve stopped breathing. Maybe a while after. Thanks, Linda. I’m not quite as reader-friendly on these as I normally like to be, but length was getting to be an issue. I doubt this is the only time I’ll be writing about these things, and they’ll probably be less broad and more explanatory. Thank you, Binx! You made me realize that my past product design routine is leaking out, as the usual project involves familiarizing yourself with existing markets and products before trying to develop a design concept that will meet all of the requirements on the new list. Lose focus, and something catches you by surprise later and sidelines that concept approach, trashing the schedule and budget with wasted time on a dead end effort. But, I suspect that one man’s “thorough” is another man’s “obsessive”. At least I’d found a way to channel an obsessive nature into billable hours! Seriously though, as you said, ending up with something that will do the job takes some up-front work, getting informed first, and maybe just enough to develop a knowledgeable bias!